Legend of Zelda. This series has grown up with gaming and, indeed, with most every gaming generation. The timeless story of a destined hero saving the world retold in many ways, with many different stories, but always the same snazzy green tunic. How do I love Legend of Zelda? Let me not count the ways, so as to not bore you, dear reader. I will be up front and as frank as possible—I love The Legend of Zelda, and even the worst game I’ve played in the series was still entertaining. I have had next to no bad experiences with the games, so of course I was excited when The Legend of Zelda: Skyward Sword was announced. Could the second game on Nintendo’s current gen console possibly live up to the high standard of the others? Does it capture your imagination, or is there a dark secret keeping this game from being as good as it could be? A general fan favorite in The Legend of Zelda series is Ocarina of Time. I postulate that this adoration is due to the game’s vastly improved story and characterization, both being deeper and much higher quality than in previous titles. Since OoT’s release, both Wind Waker and Twilight Princess delighted fans, though admittedly there was a bias against them. It seems the trend amongst gamers lately has been “the current Zelda game is okay, but not as good as the last one.” I am not sure why this is, but seems a bit like hivemind speak, and that is bloody annoying. 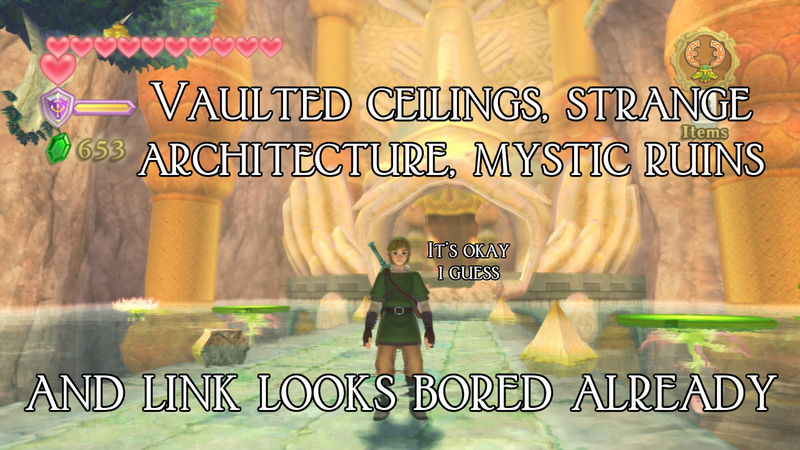 In my opinion, the games have been getting better with each title, and that does not stop with Skyward Sword. The story of this title is absolutely incredible. Link and the rest of his human cohorts live on a floating island called Skyloft, where everyone rides giant birds and appear unafraid of falling off the island. Zelda gets sucked below the cloud line by a terrible tornado and Link’s journey begins. With the assistance of the spirit of his sword, Fi, he embarks on a quest to the land below to find Zelda. I will spoil the story no further, but it is absolutely phenomenal. 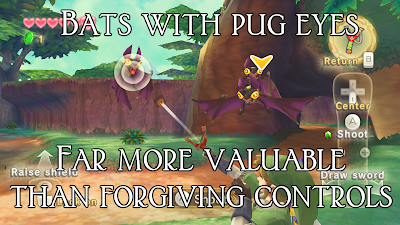 This game marks the first time that I have sincerely cared about Zelda’s wellbeing. I know Zelda’s safety is the chief objective in most of the other games, but this is the first time I felt an emotional connection to her. The characters in Skyward Sword are so incredibly well done; I was brought to tears more than once by inspiring speeches, tender moments, difficult trials, or painful situations. Nintendo has done a phenomenal job with the plot and I hope this is a continuing trend. It has been some time since I cared about what happened to the characters in my game, but I’ll be damned if Skyward Sword didn’t turn on my heartlight. The gameplay is usually quite good, as well. Being able to recenter the camera is one of the best improvements, and is a feature I wish this feature was included in more Wii titles. Though the camera was more fluid and became annoying at times, being able to recenter it made the experience much less painful. The sword control, on the other hand, needed work. 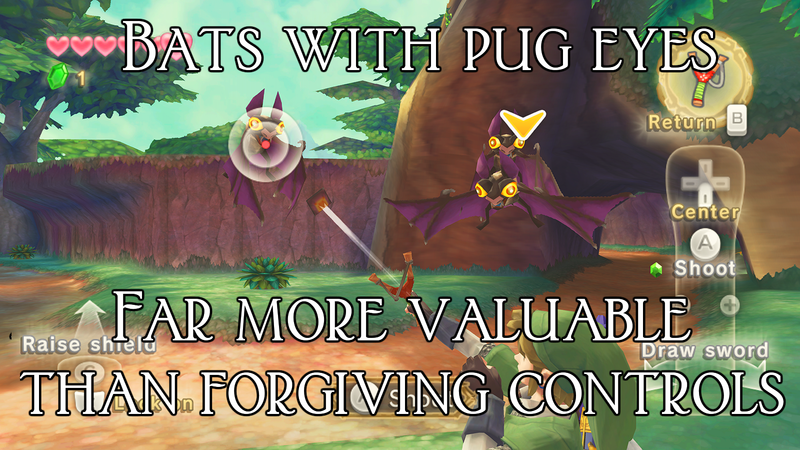 The big selling point of the combat in this game is that with Wiimotion Plus, more accurate battles are possible, allowing for combat changes, like sword swipes in specific directions. Wow, I thought, my sword can finally be accurately modeled to my hand and it will really seem like I’m controlling Link’s arm. Controlling specific directions is a bit of a mess. I found my moves not mapped accurately at all. Very specific sword moves would often be performed correctly, at least in my mind, only to have a different move done, perhaps because of a slight flick of the wrist in the wrong direction. The worst function for this is the sword stabbing motion. If your hand is not perfectly level straight ahead, or your Wiimote dips up or down in any way, you cannot stab. Worse, if you have a shield equipped, unless you keep your left hand quite still, you may end up shield bashing for no reason in the middle of an important boss fight. It feels to me like they marketed this feature before critical testing was done, and when it was revealed to not be the best at being accurate, they had to keep it in because the public already knew about it. I cannot begin to count the times I have been in an important boss fight only to have my efforts thwarted not by my enemies, but by my own dastardly arm. Perhaps I ingest too much caffeine and sugar daily to keep a steady hand, but I just do not see how people could be happy with the responsiveness of the controls. Pair that with the growing trend of modern games to overexplain everything to the audience so as to not only remove challenge, but instill annoyance, and this game can get to be a pain to play at times. I know a disproportionate amount of this review was spent griping about the controls, but I sincerely loved the game. The visuals are absolutely stunning. Every new area looks different and each looks to be hand painted in watercolors, a look I am quite fond of. The colors are eye popping and visually engaging, producing an environment that really inspires fun. To complement the visual style, each area's music fits it quite well, as Zelda games are wont to do. Though they may not be impressive musically, they certainly do conjure mental images that I would typically associate with the area (i.e. Eldin Volcano reminds me of bones and orange rocks). Additionally, the main theme is one of the best the series has heard, even if it is Zelda's Lullaby backward. 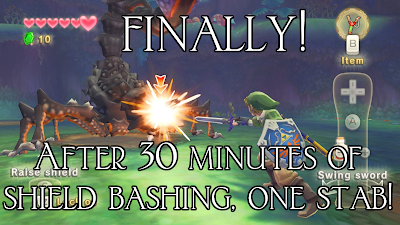 The length of the game is also something of note, as it took 30 hours for me to complete, with very few side quests. A game that long is nigh-unheard of in today’s market. And they were 30 good hours of great fun with minimal frustration—another rarity. The puzzles in the game have been improved to be more challenging, forcing gamers used to simpler games to dig their brain out of whatever Mario Party case they left it in and engage. Each dungeon presents its own set of rules and challenges within which the player must work around and solve. 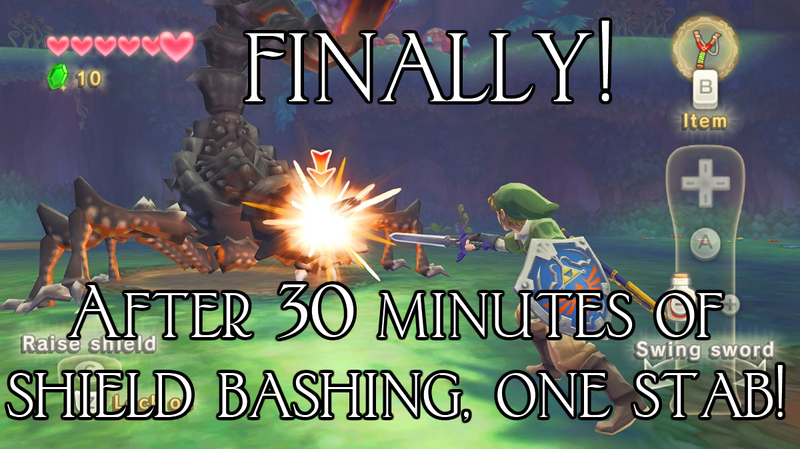 This difficulty is only bolstered by new items in the Zelda universe. The beetle and whip alone show that Nintendo put quite a bit of thought into how to improve on something that was already quite good. 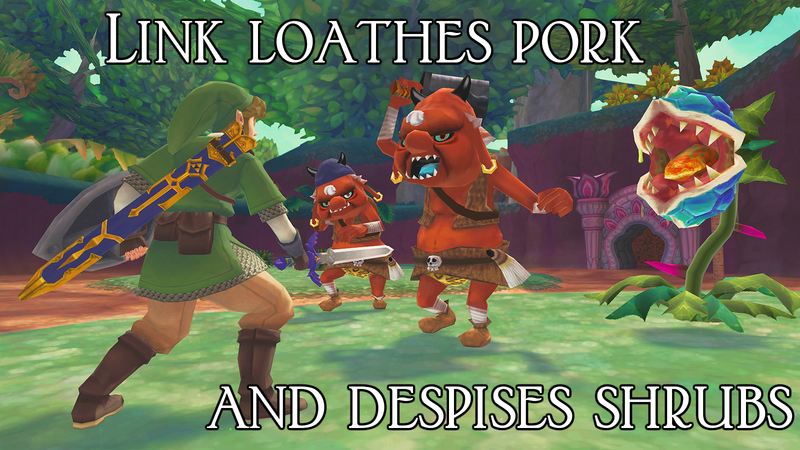 Simply put, Skyward Sword is the best Zelda game yet. Yes I said it, better than Twilight Princess, better than Link to the Past, and even better than Ocarina of Time. The control issues were not nearly enough to hinder the amount of joy I derived from playing this game. Immaculate story, challenging puzzles, gorgeous settings, and enough nostalgia to keep Zelda fans interested and enough new to make it feel like anything but a rehash. I am absolutely enamored with this game. If you love fun, this is your game. I am serious. Go buy it immediately. There is no better Wii game and there is no better Zelda game in my opinion. New to the series? Old diehard fan? 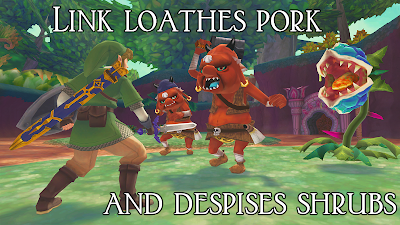 It matters not, Legend of Zelda: Skyward Sword is a phenomenal game that will keep your face in pain from smiling so much. Kotaku reports that Ubisoft has moved Assassin's Creed yearly release date up a month today. According to them, Ubisoft announced an October 30th release date for Assassin's Creed 3 during a call with investors. At this point, it's anyone's guess as to who will star in the game, what era it will take place in, or what organizations will be involved yet. A common theory so far points to the American Revolution. Accordingly, we have come up with an artist's rendering of what it may look like.